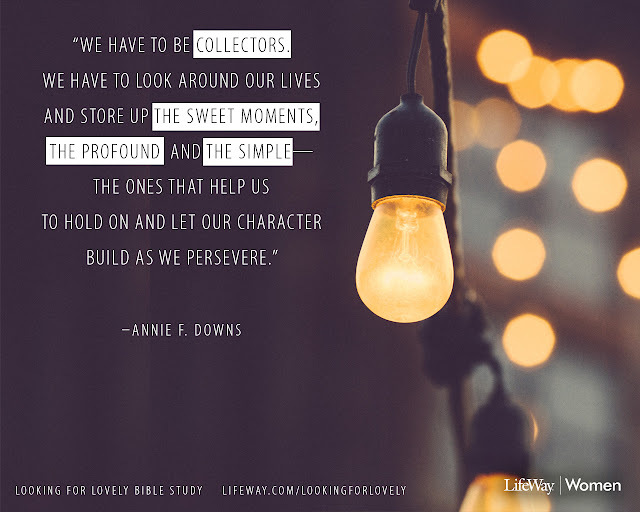 Last fall, the Women's Group at my church did a study called "Looking for Lovely." Never in my life has the Word of God been as tangible to me as it was during the weeks of that study. It came during a season where I was desperate for truth to be spoken into my heart and into my life. I needed encouragement and hope, and every day the Lord spoke to me through the pages of that study in a way that I have never known before. It was true intimacy with Him, and I am so grateful for that time of maturing in my faith, although the growing pains seemed unbearable at times. Today I'm in a completely different place for the most part, but I've asked the Lord to never let me forget the truths he spoke over me during that time. Never. Humble me flat on my face if you need to, God, but let me not forget that your strength was made perfect in my weakness. 1. It's Just the Flu - there is so much sickness and suffering in this world. I am so grateful to have two healthy kids who can bounce back from this illness quickly and who have access to excellent health care. 2. I Can Afford To Take Care of My Children - being sick is stinking expensive. You have to buy medicine, special foods cause sickies have weird cravings, cleaning products to disinfect the house, and there's a lot of eating out because there's just no time to cook when you're caring for kids around the clock. How nice that we can eat fast food for two weeks and not feel a financial strain...although my waistband feels the strain! I well remember the days early in our marriage when this would not have been the case and would have negatively impacted our monthly budget in a big way, so the gift of financial stability is not lost on me. 3. Wonderful Jobs - Eric and I have both been blessed with employers who have accommodated our need to be home. Enough said - we are so, so grateful for the understanding and support! 4. An Amazing Spouse - Eric and I are really a good team. Even when we are super stressed and getting on each other's nerves, we are strong teammates. We have amazing families, but they are too far away to be at our beck and call when someone starts puking at 4:00 am or when we have to readjust schedules at the last minute, so from the very beginning, we've had to learn to depend on each other. We don't do some things as well as we should in marriage, but this is one of our strengths. Last week was so wonky, and I'm not sure we spoke more than two words to each other that didn't pertain to the kids. But we were in the trenches together, and I am so grateful for a husband who will take temperatures, snuggle sick babies, and research every prescription known to mankind. 5. Extra Time With The Kiddos - being a working mom is not for the faint of heart. Ok, being a mom is not for the faint of heart! But sometimes I feel like we fall into a rut of go to school, go to work, pick up kids, eat dinner, do homework, take baths, go to bed, repeat. Being able to sit with Ellie and watch one princess movie after another was precious time, even if she was burning up with fever. And getting to snuggle with Eli was so good for my heart because that hyper little guy never sits still for more than two minutes. 6. More Time In The Word - I think sometimes the Lord needs us to "be still" so that he can speak to us. Naturally, our pace the past two has been a bit slower. I've read two books in two weeks and both were full of words that my soul needed. 7. Playing Catch-Up - yesterday I spent almost two hours talking to my college roommate while vegging out on the couch. Our schedules never jive, so it was amazing to catchup with her. We had a very stimulating conversation and determined that 30 somethings are a lot like "tweens." We're too young to be seasoned vets at parenting and marriage, but we're too old to hang with the younger folks. It's kinda like being an adult middle-schooler. Ha! I think the topic will be a future blog post - we are just trying to find a fitting label that will stick - like "tweens." The past two weeks have been crazy, and I am so ready to be back among the land of the living. I'm behind at work, my house is in chaos, and I'm itching for the stability of a predictable routine. But if I learned anything last fall, it was to look for the lovely moments in the less than lovely situations - so here is my short list of gratitude from the Watson Flu Epidemic of 2017. I think it ranks up there with the bubonic plague of the mid-evil times...just saying.